Must of us love music and we listen to various songs and tunes every day. It often happens that we have to listen through our headphones, for example at work or at home, so that we don’t disturb others. This is where Mr. Kuokka77’s YouTube channel comes in as a great alternative. 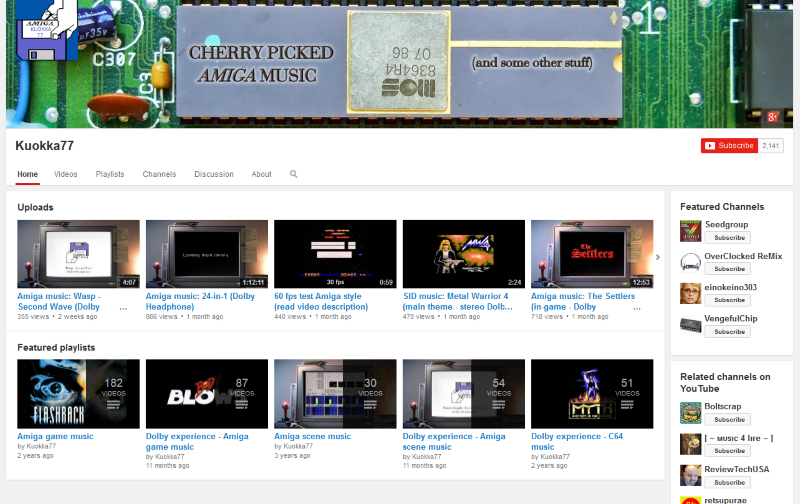 If you take a look at his channel, you will find tunes from games like Flashback, Turrican, Beverly Hills Cop, Body Blows, Zool, Lotus, Super Cars and many, many more. He has also done demos as well, for example State of the Art from Spaceballs. Kuokka77 states on his about-page that he takes requests, so if you have a suggestion he might be interested. What do you think of this YouTube channel and of the music present there? I certainly love it. Perfect for those times I need to use my headset (which is very often). Hired Guns on the Amiga was one of my favourite video games ever, the music was especially good and still sounds ace! Wow. Well done! Thanks for sharing. Thanks mate. 🙂 This guy has done an incredible job making the Amiga music “rock” in the headphones. Brilliant. I see he has The Settlers on there. I’ll have to send that to my mum, she played that game non-stop on the Amiga for about 5 years.